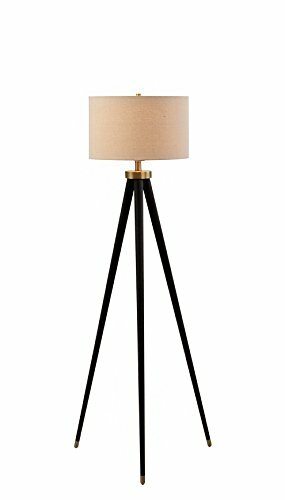 Illuminate your living room, family room, or office with this mid central modern styled floor lamp. The metal floor lamp features Dark bronze finish with metal accents and a natural linen shade. The cord runs through the leg of the lamp and is not exposed on the outside giving the lamp a sleeker design. This lamp is rated for 120-volts and uses a 3-way 150-watt incandescent bulb or 3-way E26 CFL spiral bulb. A 3-way E26 CFL spiral bulb is included. The light source is soft and the illumination is pointed downwards. Floor lamps are often used in combination to provide ambient lighting. There is a 3-way rotary switch placed on the body of the socket offering three degrees of lighting from low, medium or high. This product is UL and cul listed and approved. The shade mounts with a harp and measures 16-inches (L), 16-inches (W) and 10-inches (h). the lamp measures 60.25-Inches (h) 16-inches (W) by 16-inches (D); this 9.7-Pound lamp is a perfect addition to your living room, family room, dining room, foyer, office or ideal next to a chair or couch. Catalina 19936-001 3-way floor lamp comes with a 1-year limited warranty against defects in materials and workmanship.